In Albanese’s America: Religions and Religion, many chapters bring up the idea of religion as a sense of history. For example, the Hopi had accounts of their origin through a Trickster figure known as Inktomi the Spider, and many of their religious rituals and practices honor figures of their supposed history. The same goes for Jews; the Sabbath “memorializes the God of Israel, who created human beings out of nothing” (Albanese 51). They also commemorate events such the giving of the Torah to Moses on Mount Sinai. For Christians, there are many holidays celebrating their history, Easter being one that memorializes the Resurrection of Jesus Christ on the third day after his crucifixion. The history of gods, origins, sacred events, etc, obviously plays a large role in the shaping of many religious practices in America. But what happens when a religion’s certain historical beliefs conflict with something….like science? We see this issue arise in the debate between creationism and evolution. Although the two have been debated for years, the recent debate between Bill Nye (evolution) and Ken Ham (creationism) has brought extreme attention to the topic. Nye and Ham represent two people on opposite sides of the spectrum, and as one can see in “Bill Nye vs. Ken Ham: Are evolution and religion at odds?” people don’t necessarily take specific sides. For many, science doesn’t necessarily eradicate religion, and religion doesn’t have to completely ignore science. For example, 24% of Americans believe that evolution occurred, but that God guided the process. However, there are Americans (33%) who believe that humans have always existed in their present form. I was intrigued by this extreme view, one that fully accepts creationism and denies evolution. More specifically, it was Answers in Genesis that really caught my eye. Ken Ham, the creationist defender, is the CEO of this ministry, and it seeks “to expose the bankruptcy of evolutionary ideas” and proclaim the truth of biblical history. In the AIG video, it shows that they even built a Creation Museum to provide exhibits outlining the events of this history. 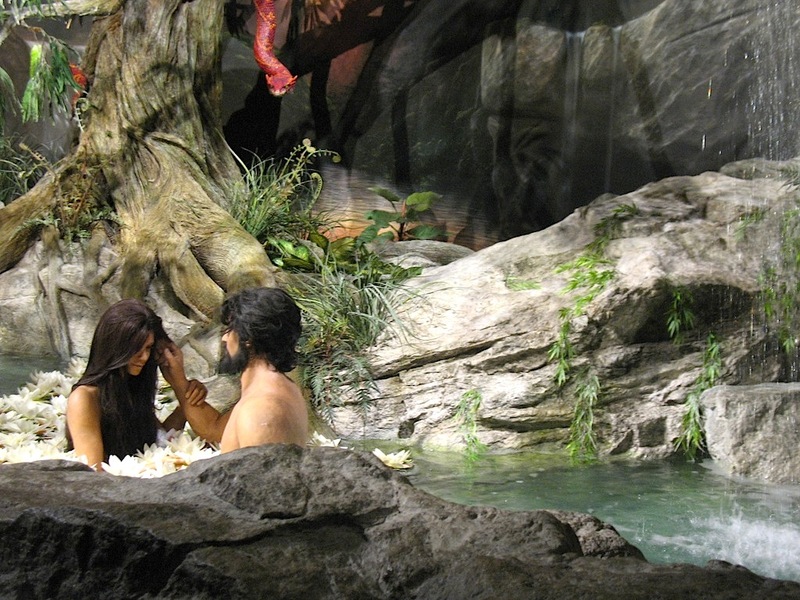 The Garden of Eden exhibit at the Creation Museum in Petersburg, KY. Answers in Genesis completely denying evolution reminds me of the religious groups who immigrated to America and refused to accommodate to the culture. What’s similar is the idea of remaining true to every detail of one’s religion while surrounded by new and opposing forces. There were those who mixed traditions, who combined their orthodox ways with the modernity of America. Similarly, there are people who are infusing science into biblical history: still accepting certain parts of their faith while also accommodating for modern scientific evidence. But Answers in Genesis will have none of that. Religion as history is not something they’re willing to give up or even alter. Some people merely see biblical history as a series of stories used to teach lessons and instill moral values. But AIG sees it as a history book. And what’s interesting is that no matter how far we’ve come in the realm of science, they are not willing to abandon their beliefs in any way. It intrigues me that the idea of religion helping one make sense of the world can mean radically different things for different people. For AIG, they have complete faith that this book is a “reliable, eye-witness account…and can be trusted to tell the truth in all areas it touches on.” But what about the eye-witness account of the laws of nature and the scientific evidence we have today? How each person deals with this conflict is symbolic of religion as a whole in America. Everyone interprets their religion in different ways. Some abandon certain beliefs and keep others. Some adopt an entirely new way of thinking; some abandon religion completely. And some hold on strictly to their traditional ways. Conflict is what has, does, and always will drive religious change and diversity in America.